And the reason is a simple one. Even though they are responsible for the BIGGEST opportunities and the LARGEST accounts – they would all be absolutely horrified if the word “SALES” ever appeared in their job title or (heaven forbid) on their business cards. 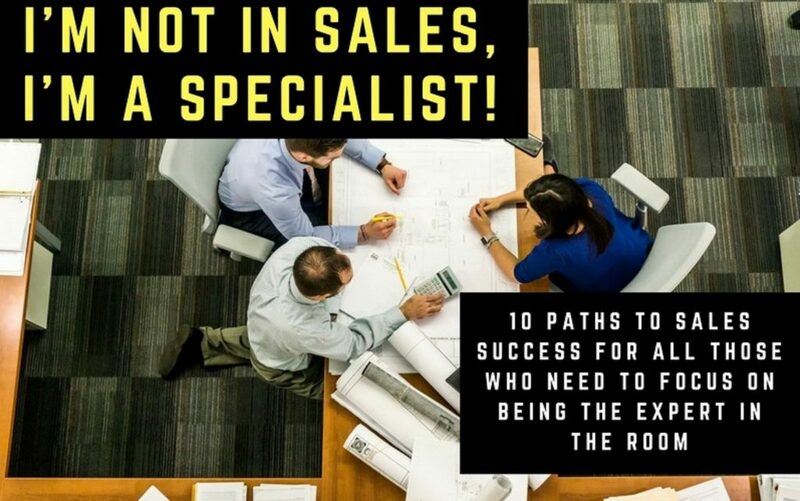 I’m willing to bet good money that they worked hard to get where they are now – they don’t want to be viewed simply as “the sales team” – externally they are seen as experts in their field, trusted advisers to their client base. But that can cause a MASSIVE headache for anyone running the business – because if that group of people are responsible for driving sales or hitting the annual targets, then their view on sales skills can become extremely damaging (and career threatening) – not to mention the dramatic effect it will eventually have on the bottom line. So, if that rang any bells with you – then you’ll be delighted to discover that we’ve just finished putting together a series of emails built specifically to help people who feel exactly the same way. Unlike other seemingly similar courses, this free email series wasn’t created to attract the “Wolf of Wall Street” lovers out there or the “Apprentice” hopefuls. This is for people who are experts in their specialist sector – it’s not for the knock and run sales hopefuls who think everything can be achieved with a couple of clever phrases or the minimal amount of effort. I’ve worked with hundreds of specialist industries – and I know exactly what works and what doesn’t – and also how people (just like you) need that information delivered. And I’ve put all that experience into this free email series.